Founded in 1989, Wastequip is the leading North American manufacturer of waste and recycling equipment, and the only manufacturer to offer a full line of steel and plastic products to collect, handle and transport waste and recyclables. Headquartered in Charlotte, North Carolina, Wastequip has manufacturing facilities throughout North America. It’s like we went from a convenience store to a big box store in about a year. In 2014, Wastequip set its sights on a new goal--to consolidate its parts sales into a new company called Go To Parts. Up until that time, each Wastequip brand --including Toter, Galbreath and Pioneer-- sold parts individually, each using independent sales, ordering and eCommerce systems. 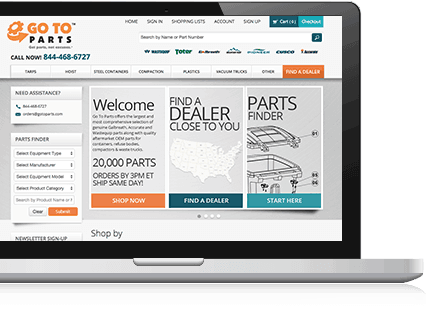 With a combined 10,000 - 12,000 parts sold to more than 15,000 customers, Wastequip’s goal was to ultimately provide better, more efficient customer service through the Go To Parts business. Jarrod Eudy, Product Support Specialist at Go To Parts, likens the process to “going from a convenience store to a big box store in about a year.” Though the goal was huge, with a collaborative company culture and a successful implementation of Nomad erpCommerce integrated with its Exact Macola ERP, Wastequip did, in fact, achieve this goal. Nomad really does a lot more work for us than a simple eCommerce system. We’ve put Nomad to the test on a completely different level. The goal of combining the sales of all brands into one system was just the beginning of the complexity for Go To Parts. The company needed a system that could handle thousands of products, for thousands of customers--with each customer having a unique pricing code, unique pricing variables, and unique discounts on all products. Additionally, as Go To Parts utilizes Exact Macola ERP as well as a 3rd party shipping group, in order to run the business efficiently, Go To Parts needed a solution that would enable the flow of information between each of these systems. “Nomad really does a lot more work for us than a simple eCommerce system. We’ve put Nomad to the test on a completely different level than most other vendors,” says Jarrod. After thorough market research, Go To Parts chose the Nomad erpCommerce solution. “Other eCommerce systems would not have been feasible for a small business like ours,” Jarrod notes. A traditional eCommerce solution would require a full-time developer to maintain the system and additional resources to integrate the system with ERP, and in Go To Parts’ case, with the 3rd party shipping group as well. But with Nomad, Jarrod has been able to administer their Nomad eCommerce site, teach others within the organization to use, update, edit and customize it, and still successfully handle his other, non-website-related job responsibilities. As any changes made to pricing, availability or inventory within Wastequip’s Exact Macola ERP are immediately reflected into Nomad without the need for duplicate entry, not only are customers able to view their invoices and order tracking information after they place an order, but throughout the ordering process, they’re also able to view accurate inventory availability and their customized pricing and discount information. With the goal of improving customer service achieved and easily maintained, Wastequip is now setting its sights on new growth goals. Seamless integration with ERP and 3rd-party software: Nomad is able to seamlessly “talk” to Wastequip’s Exact Macola ERP and 3rd-party shipping software, so that within an hour after an order is placed, Wastequip is picking the order to be shipped. Optimized for complex pricing situations: Nomad allows a company of Wastequip’s size and scope to implement many, complex product, pricing and discount options with ease. User friendly design and marketing options: Wastequip is able to add, update, and change product info, images and look of the website with ease. Improved customer experience: Wastequip customers, especially larger accounts, love the ability to view invoices and order tracking without having to call customer service.